The modern wireless technology has always proved to be of great essence to many folks in such a way that sharing files over Wi-Fi between the same or other operating system is no longer a tedious task. Gone are those days when our android smartphone "Bluetooth" services serves as the main source for file transfer. Nowadays, with the right app on your phone you can easily transfer files to your computer just with WIFI connection. We found an great app for this purpose – MobileSync App. What is MobileSync App all about? The Mobile Sync app is helpful and practical tool developed especially for android users that need help to transfer files fast and easy using only their WIFI connection. On this effortless app, users can transfer files, photos, text and videos automatically between their android phone and Windows computer. 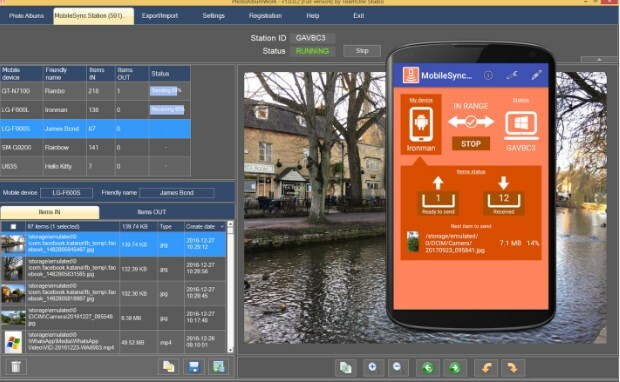 The app is quite easy for using, allowing its users to connect and communicate with the Window’s Mobile Sync Station. The users need to setup the app only once without the need of QR scanning and copying the IP address for each sending or receiving operation they want to do. With the app, multiple android devices can run to sync or transfer files. With the help of this app, users can simple and fast transfer any file from their android smartphone to their Windrows computer without using cables, just with their WIFI connection, automatically. On the app, users can transfer the files just with dragging and dropping them to the operation in the Window’s MobileSync Station. Using this app, users can also use the Watch Folders which offer them to detect new files created on the android and putting the files in the send list of the app for easy transfer to the MobileSync Station in Windows. The app does not needs USB cables because the connection is made over WIFI. No need of turning WIFI hotspot or Ad-Hoc mode and no limitations for file size or time for transferring files.